See Swans on Song as Shaheens Fall for the regular match report. 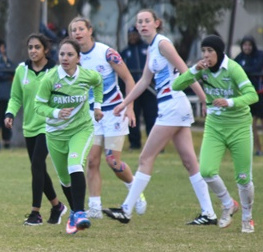 It was cold, bloody cold at 8.45 am on Sunday morning when the GB Swans took on the Pakistan Shaheens in the first match of the women’s division of the International Cup. It was even colder for some of the Pakistan Shaheens who had left Lahore on Thursday when it was 40 degrees, another disadvantage against the Brits who had been enjoying mild summer maxes of 20 degrees. The cold reminded me of 9.00 school matches on a frosty ground in Lenah Valley, in Hobart’s winter cold, when the ball hit the fingers like an ice block, and like the players in the first quarter, we dropped chest marks too often. Today, perhaps it’s just cold fingers for the keyboard warriors as well, or for the goal umpire from Warragul who brought his local coat, rather than the IC17 slightly less insulated ones. That really helped when the north wind turned into a gale after half time. Sometimes the story of a footy match is about the weather. Some other times it is about one side rather than the other. On this day, when the experienced, bigger and taller GB Swans comprehensively defeated Pakistan, kicking 20 goals against an opposition that failed to score, the story was more about the loser. While the Swans are a tournament favourite, having defeated Ireland in the Euro Cup in 2016, and Stacey Hughes’ four goals for the Swans and the dominance of Dannie Saulter and Frankie Hocking in general play was a match-winning story, it was somehow smaller than the Pakistan story. The Pakistan story is in itself a miracle. In a country affected by wars, refugees, internal conflict and power shortages, the footy story had an unusual beginning. It began in 2006 in the wild, and often unruly world of the North West Territories on the borders with Afghanistan, in the Swat Valley, an area in which players still have few footballs. As in several other countries, sport and education went together, in building a better life for individuals, and early teams grew out of educational institutions. Several Shaheens players, who come from Gilgit in that area, trained in more central Lahore and Islamabad in the lead-up to the International Cup. Many of the Shaheens players came recently from other sports, including cricket and Pakistani wrestling, and few had played full matches, let alone 18-a-side matches, before they arrived in Australia. Make-up teams were the prelude to full on footy in Melbourne. Coming to Melbourne meant missing school for several players. Wearing green tracky dak pants and long socks, but not headscarves, the Pakistanis were also smaller and lighter than their more experienced British opponents. Inevitably, the Swans readily took the ball out of the centre in the opening minutes and eventually goaled after some early fumbles. While Pakistan took the ball forward eight minutes in a dropped mark saw the ball taken away. Soon it became a procession with the Swans having 13 goals on the scoreboard by half time. As the northerly wind strengthened in the third quarter, the British Swans kept attacking against the wind but the Pakistani Shaheens were finally marking the ball in defence. N. Ul Nisa, A. Habib, M. Ahmad were leading the way in giving the Swans a contest, on the ground if not on the scoreboard. Even after the Swans ran out winners, 20 22 142 to a scoreless Shaheens, it was the footy which mattered. In that other cliché which is also a truism it was a match characterised by ‘many cultures one game’.